Details This ANGLO AMALGAMATED ABC double-bill features and "X" Certificate with an "A" Certificate. The poster has the right-hand bottom corner missing and a few small archivally repaired tears along the bottom centre-fold line. 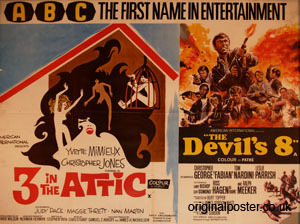 This film showed at the ABC Wakefield on 16/11/1969.